Syrian army personnel load howitzers near the village of Morek, Syria, Oct. 7, 2015. Forces fighting for Syrian President Bashar al-Assad are struggling against rebels in the country’s northwest, despite substantial backing from Russia and Iran, according to U.S. officials. But they caution that both Russia and Tehran seem prepared to dig in and intensify their efforts. 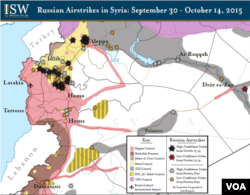 “Pro-regime forces have had little success to date, despite a marked increase in Russian airstrikes in recent days,” a U.S. intelligence official told VOA on condition of anonymity. 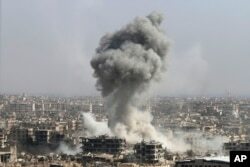 “The [Syrian] opposition is definitely putting up a formidable fight in that area,” the official added. Smoke rises after shelling by the Syrian army, after Russian airstrikes, in Damascus, Syria, Oct. 14, 2015. Three weeks into a Russian air campaign over Syria, victories for pro-regime ground forces have been restricted mainly to skirmishes on the outskirts of key cities like Homs, Hama and now Aleppo. Also, the addition of Iranian Revolutionary Guard Corps troops to a coalition that included remnants of the Syrian army and Iranian-trained Shi’ite fighters from Iraq, Pakistan and Afghanistan seems to have made little difference. Instead, analysts say, Iran has suffered a growing number of casualties, with estimates of IRGC deaths ranging from 20 to 200, including several top commanders. Rather than back down, however, Iran has become emboldened. “There is a change in nature and Iran seems to be much more involved and much more willing to use its own soldiers," according to Michael Horowitz, a senior analyst at the Levantine Group, a Middle East-based geopolitical consultancy. “It is very notable that we are seeing an increase in the number of high-ranking Iranian officers that have been killed,” he said. 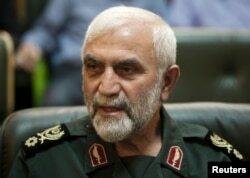 On Monday, Iranian state media reported the death of IRGC commander Moslem Khizab, while also noting the deaths of three other high-ranking officers the week before. Another key Iranian commander, General Hossein Hamedani, was killed earlier this month on the outskirts of Aleppo, a loss one U.S. intelligence official described at the time as a “psychological blow” to pro-Assad forces. McInnis, who previously served in analytic and advisory roles with U.S. Central Command in Iraq, compared Iran’s experiences in Syria to the “mission creep” the U.S. experienced in Iraq and Afghanistan over the past 15 years. Still, U.S. intelligence and defense officials say all indications from Iran point to a “deepening involvement in the conflict,” with military support for the Assad regime continuing to grow. U.S. officials warn that Russian supplies also continue to pour into Syria, both by air and sea, and that pro-regime fighters continue to mass in the areas around Aleppo. An image taken from video purports to show explosions after airstrikes carried out by Russia's air force on what it said was an Islamic State ammunition depot in the Syrian province of Idlib, Oct. 14, 2015.. In the meantime, Russian airstrikes on rebel positions are starting to take a toll. Commanders with Fatah Halab [Conquest of Aleppo], which brings together more than 30 rebel factions, say they are starting to take heavy casualties, including the commander of a militia that has received U.S. supplies and training. Another Russian airstrike Monday in Latakia province killed Basil Zamo, a commander of the First Coastal Division, another of the rebel groups believed to have gotten U.S. support. U.S. officials and analysts also caution that the number of airstrikes targeting top rebel leaders is only likely to increase, as Russia expands its use of drones and other advanced intelligence gathering techniques. There also is concern among Western analysts and officials that a bigger push from Syrian, Iranian and other pro-Assad forces – numbering upwards of 10,000 fighters – still could be on the horizon. The ultimate aim, they say, is wresting control of the M5 highway, which links Damascus, Homs and Aleppo, from rebel forces. Jamie Dettmer contributed to this report.